When life feels overwhelming and the days far too full, I go into my little sewing nook and count my blessings! 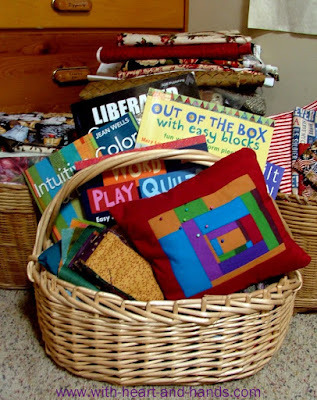 I am so grateful to have baskets of happy fabrics just waiting for creative opportunities! Grateful to have lovely books to read, and to be inspired by. Grateful to have the chance to learn from all of you, as I go around all of the hundreds of blogs and websites that I visit weekly! Grateful for your friendships, both virtually, and in real life. Grateful for all that read here, comment here, and join me in my 'friends connect' so that I can discover, and visit you, as well! Grateful that our one big night of thunder and lightning in Oregon..the one that had my chicken cackling in their coop, and my cats refusing to come inside from the rain, and me running around like a crazy lady in my nightgown at 2 am scooping everyone up and out of the rain... WAS only a storm and NOT a hurricane! Grateful to be offered so many opportunities to share, and feel the blessings of helping others in need. I always try to remember, that no matter how tired I am, or how challenging my personal life is...there are SO many others that are so very worse off.... and many of them STILL count THEIR blessings! So, as I look at my fat little pincushion above, made after my lovely color class with Jean Wells, here in Oregon...I think of my ability to take small ideas or even small worries! and suddenly find them growing into much larger ones... and I remember that it just gives me more chances...whether it is to display pins..... or choose differently next time! And yes, I really did start out with the desire to make an eensy, eensy little pincushion! But I still love this sassy bigger one! My thoughts and prayers go out to all of you now facing Hurricane Irene and wish her a very 'good night' and a very 'quick exit' out of town..or perhaps only a 'wimpy entrance' to begin with...and a 'great big fizzle', right off! My prayer is that all of your storms be minimized.,instead of magnified, and may all of you face whatever challenges you do have, and still find joy and blessings....no matter what! Thinking of all of my blogging friends on the east coast. Keep in touch with all of us! Special Give Away/Drawing: And after the weekend, stay tuned...as I will be offering several really nice giveaways ! Expect the post on Monday if I get the 'details ironed out' and Tuesday or Wednesday ...if it takes a bit longer ;) I'm still waiting on part of my give away ! And we are so grateful for you!! eEnjoy your happy nook!! Reminding me to be grateful and not so much gripeful. So much to be grateful for, yes, I agree! Thank you for sharing today! Blessings! Joyful that kindred hearts find one another across blogland. Thank you, Michele, for your lovely words today. I'll share them with a friend. Heart warming post! Thanks, Michele! You are a gift! We are staying indoors and stocked up with all the necessities. Even little sewing planned for the weekend. Let's see what tomorrow brings. A lovely post, Michele, well said! I am a follower and don't think I'm having any trouble getting your latest posts on my Blogger reading list. Thanks for your lovely post. I really needed to read something like this as it has been a very stressful week. Thanks again! What a beautiful post. You are such a special spirit. I'm so grateful that you're going to hold giveaways! Yay! Beautiful post! I too count my blessings everyday! Just found your blod and am now following. Beautiful header. Very sweet post! So many good thoughts there.